This lesson will help students understand how scientists collect and organize evidence for evolution. In the first activity, Evolution and Time, students will create a journal entry and a birthday card that will describe the geologic ecosystems of particular time periods to gain a better understanding of the vast scope of geologic time. 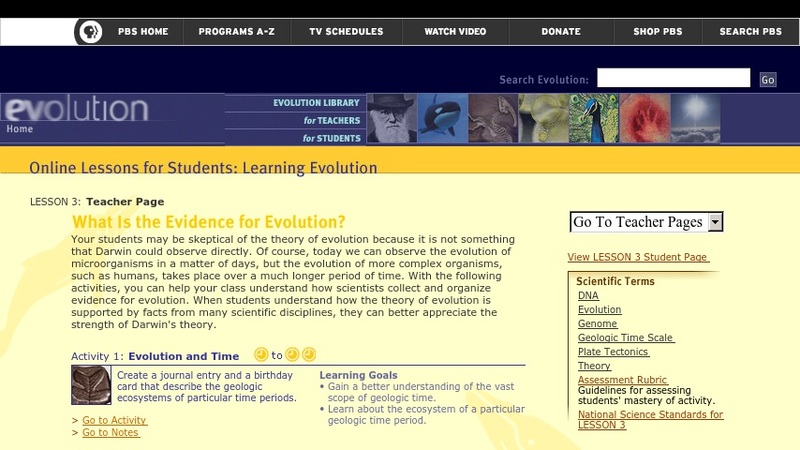 The Evidence for Evolution WebQuest has students surf the Web to find evidence for evolution from three different areas of science: paleontology, molecular biology, and anatomy and physiology. Each activity has a list of objectives and links to detailed instruction. The lesson also offers links to an assessment rubric, the national science standards for the lesson, and additional activities.